Told through a series of short stories or vignettes with different points of view, and all occurring in the span of a single day, Read Between the Lines gives us a glimpse into the lives of ten individuals, connected through the high school that they either attend or work at. Among these ten characters there is the popular cheerleader who feels as though she is invisible, the successful jock who is leading a double life, the nerd who suffers at the hands of a bully, the drop-out working at the local fast food hangout and living under the controlling thumb of his father, and the new and attractive English teacher who gets no respect. Using a sensitive writing style, and a creative and refreshing format, Jo Knowles explores the old adage ‘don’t judge a book by its cover’. The truth is we can never really tell what a person is going through just by looking at them. Everyone has inner struggles that they don’t show to the world, not even to those closest to them. So instead of judging them for their actions or hating them for what society perceives them to be, we should try to put ourselves in their shoes, try to ‘read between the lines’. I found the characters to be well written, with such a great variety of personalities that every reader is bound to empathise and identify with at least one of them. Although their struggles are not resolved within their vignette, Jo Knowles has managed to give the reader the possibility of resolution, a glimmer of hope that these individuals will rise above their fear, hate and insecurities and the misconceptions and misunderstandings that follow them. 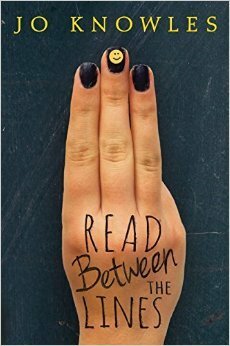 I enjoyed reading Read Between the Lines, and found it to be hauntingly perceptive and thought provoking. It was a nice change to the typical Young Adult novels making the rounds at the moment and would recommend it to teenagers and their parents, as well as teachers looking for discussion starters for their students. Thank you to NetGalley and Candlewick Press for providing me with an Advanced Reader Copy in exchange for an honest review.